In advance of my trip to NAB, I created this demo of the video light, which is the first concept I developed. This was also the first time using my new "somewhat custom" 360 camera rig. For optimum video quality for 360/VR, multiple cameras still yield the best resolution currently. Far more than 2 lens solutions. While it has been common to use 6 GoPros together in a rig, this can get pretty costly quickly. Plus they have a fairly sizable footprint. But if you do it right, and get the stitching right, the video looks fantastic! I recently stumbled upon a more cost effective solution to using 6 GoPros, while still using GoPros! The Uber compact Hero 5 Session still has the great GoPro image sensors, same resolution, etc. And I like their small size--a smaller rig with lenses closer together have less parallax errors. 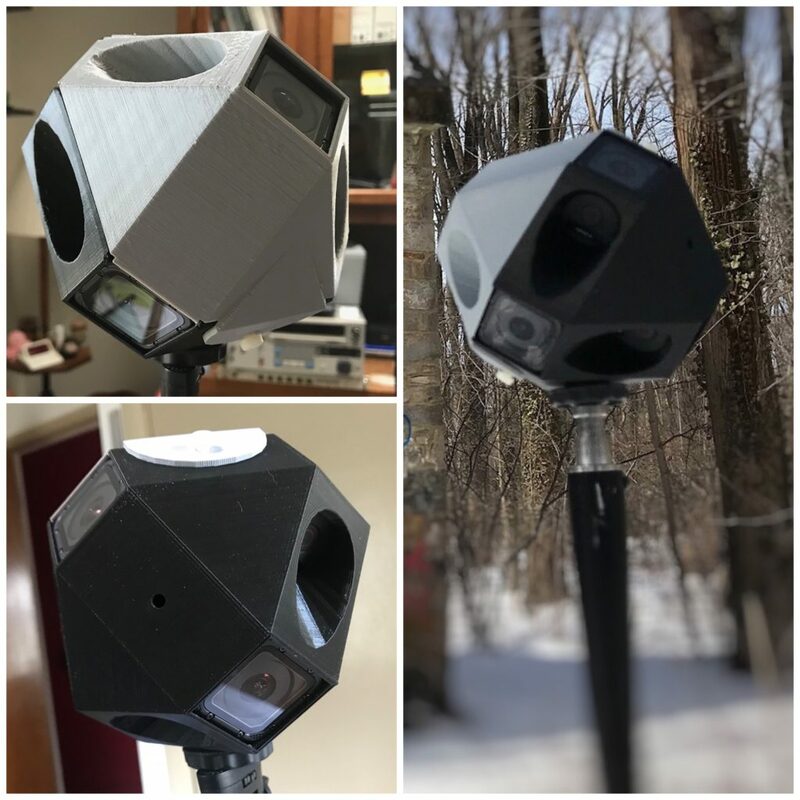 I discovered the idea of using GoPro Sessions on a site that also provided free 3D Printer files for the rig housing! So I put my printer to work, and bought 6 Hero 5 Sessions (refurbs at $150 each). The most expensive part of this was the stitching software, but it does an amazing job. Kolor's Autopano Video/Autopano Giga. Still have a lot to learn on how to use this better, but in the end, 6 separate videos stitch together beautifully. Each camera is set to 2.7k, 4:3 aspect ratio. The resulting stitched video yields 8k output. Lots of detail, looks fantastic, albeit looong render times. But this new system will let me truly "up my game" in providing high quality 360 footage. The main disadvantage of this particular set up is that I can only use the Session internal batteries. No access to the USB-C ports for power. I hope to soon work on my own 3D printed housing that mounts the cameras, but allows me to access them to provide external power. I forgot to mention: the GoPro Sessions are inherently waterproof! No extra housing needed. Now for the video. I wanted to do a video that properly demonstrated the CL360's capabilities as a video light for the 360 environment. I also wanted to do my best to use ONLY the light for the scene, with very little if any ambient light. Really push it. I had envisioned doing a 360 tour of one of the many elegant and historic places in my Bucks County, PA area. The timeframe of building the GoPro rig, my "regular career", and NAB fast approaching---I had to settle on my own modest living room. But it was easy for me to control the environment. To make interest, and because I really wanted to try it--a simple masking technique to make two of me sitting in the same room. Shot in two passes-first in the chair, then the couch watching TV. Kept the light off and sat in the dark for the first minute--then hit the remote--hello light! This was edited on my iMac using the latest version of Final Cut Pro X. Late last year Apple added 360 capability, and it works well! I could edit in proxy mode--the full 8k file is more than the Mac could handle. 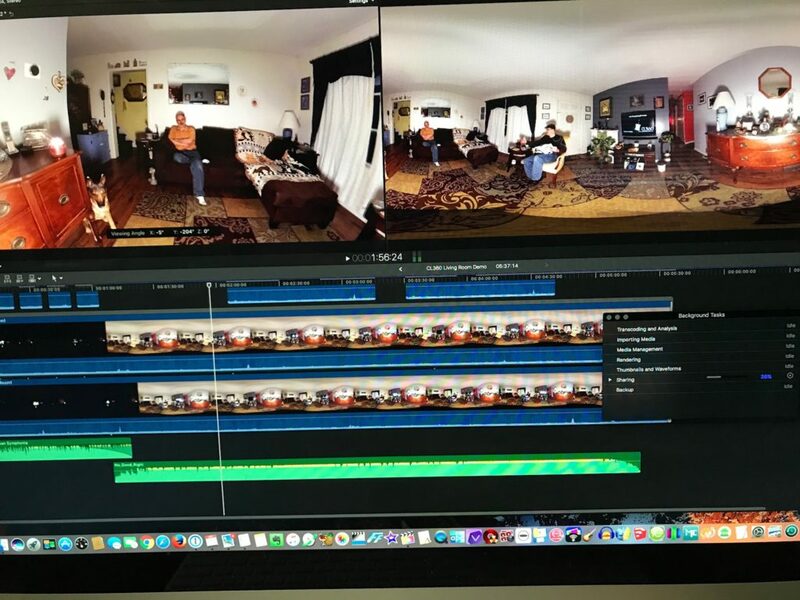 They have some great tools for editing 360, including a real time 360 viewer (left of screenshot). One of the best built in effects panels is the 360 patch. This allows you to rather quickly create a mask to remove the camera mount (or in this case the visible part of the CL360). You can apply this patch to either the nadir (bottom) or zenith (top). For the video, I opted to go back and forth with the nadir patch, to show both the CL360 natural footprint, and how it can easily be removed. You will also see various sections showing the contrast of light on, and light off. The final product below. You may need to click on the direct link https://vimeo.com/tebweb/cl360-demo1 in order to view in 360. CL360 - Camera Light 360 Video Demo from TebWeb on Vimeo.